Applications: The narrow (nominal 6mm wide) section of these wheels makes them ideal for reaching into and cleaning stainless steel pipe welds. The 150mm size also fits fillet weld grinders such as the Finiteasy long arm machine and other machines designed for easy reach into corner welds. The twisted knot wire will give aggressive cleaning action. It offers a good alternative to the unitised wheels used on these machines when removing coatings etc that could otherwise load up and inhibit the wheel. Products Notes: M14 fixing fits nearly all metric angle grinders. Use 115mm on 115 and 125mm grinders and size 150mm on 150, 180 and 230mm grinders, as well as Finiteasy machines. Stainless grade is AIS1302. Nominal 6mm wide, but will splay slightly at the ends. High knot count for performance and durability. Speed Rating: 115mm 13,000rpm. 150mm 9,000rpm. 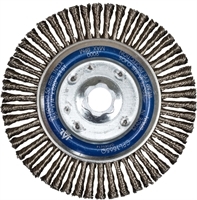 Also Available: For non-stainless pipework we stock steel wire pipeline brush wheel. We also offer other types of stainless steel brush wheels for angle grinders, such as radial, bevel and cup brushes.